If you think life is full of disappointments, you should try death for size. Less than 24 hours after my fatal heart attack on the Virgin Intergalactic flight back to Heathrow, my older sister Aggie had got that cowboy company ‘We Buy Any Dead Peoples Stuff’ round for a valuation. It was bad enough seeing them poking around my tiny maisonette before carting off all my prized possessions within the hour (leaving only half a loo roll behind), but even worse to see them place a paltry £155 in her greedy mitts for the lot. By the way, I had no idea; I thought when you snuffed it, that was it. No, no, not a bit — I’m still here — but invisible. I can make myself pop up anywhere, which...err...hmmm...was fun at first (although I can’t say I was chuffed to learn what people really thought about me. Jeez, talk about two-faced). So here I am inside the Village Hall in Bicester, the one with the crummy sign outside. I overheard someone just now say they deliberately leave the apostrophe out of ‘peoples’ and make it look rough and ready — it’s part of the image. 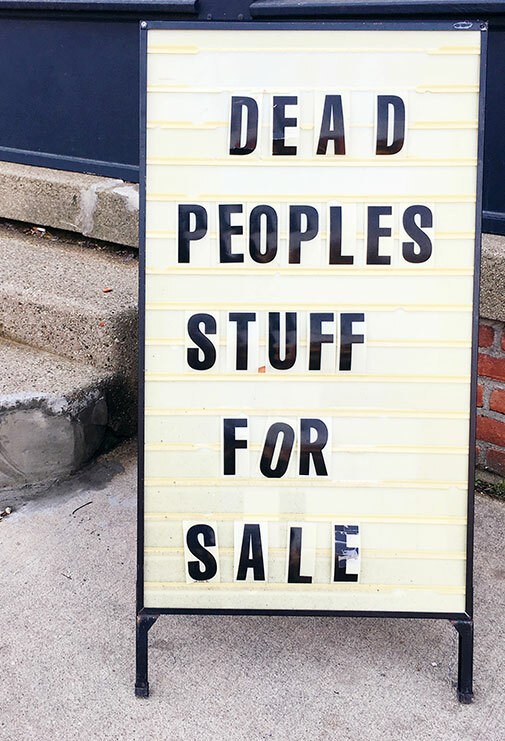 And buying dead people’s stuff (DPS) is so on-trend, it’s seen as the ultimate authentic recycling. No wonder stars are queueing up to be in their ads, like the one, ‘Your outfit is gorgeous. Is it DPS?’ starring Lady Beckham. Of course, charity shops are going bust every day now that buying plain second-hand has become such a faux-pas. Anyway, I noticed no sign of my posh telly and furniture. God knows where that lot went. I did see plenty of table tops piled with my old clothes and shoes, music and dvd collection, mugs, glasses and kitchen utensils, all decent quality mind — unlike some people’s stuff. It’s so weird to watch as they haggle over your very personal items and see them get sold cheap as chips. But d’you know what miffed me most? That old boy, a dead ringer for Malcolm McLaren, who snaffled my original copy of the Pistols first album for a quid. How’s this for cheek, he also got them to throw in my Belle Stars and Tanita Tikaram collection.